Choose 1 of your opponent’s Pokémon. This attack does 10 damage to that Pokémon. Don’t apply Weakness and Resistance for this attack. (Any other effects that would happen after applying Weakness and Resistance still happen.) If that Pokémon has a Pokémon Power, that power stops working until the end of your opponent’s next turn. Freezes its prey with its stare. If you should encounter one, remember not to look into its eyes. It’s like Fossil Muk and Kyurem NVI decided to make a really, really, REALLY unplayable lovechild. Wizards wishes their Pokemon TCG copyright was until the year 23,000. WTF?! XD Is this a fake? In slightly more detail, 70 HP was the “magic number” for BASIC Pokémon, and acceptable for a Stage 1 because 60 (or less) was too easy to OHKO. 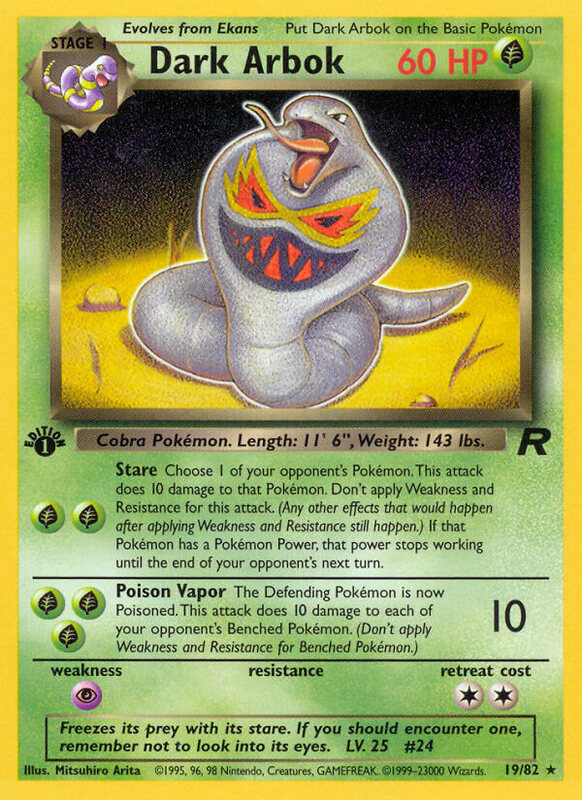 [P] Weakness would go from so-so to BAD due to Mewtwo (Wotc Black Star Promos 3,14). Stare just needed to be a Pokémon Power that did NOT do damage, making it a slightly stronger version of the “Gaze” Pokémon Power we’d eventually see on Igglybuff (Neo Discovery 40/75). Spread attacks, in general, were too slow and easily countered at this time; besides disruption and raw power, remembering Pokémon Center and how most Pokémon wouldn’t have Energy attached to them.